I know many people have iPod or other MP3 player, and buy music from online music stores like iTunes, but they all are main stream music from big music companies. Do you try to find good music from independent musicians? If you say "yes" you should be try this website. Magnatune is a music site that organize some very good music from independent musicians. It stores over 275 recording artists in a wide variety of genres and collections, you can listen all album from these musicians online, you can buy high quality music download or customized license for use music on your website or other place. 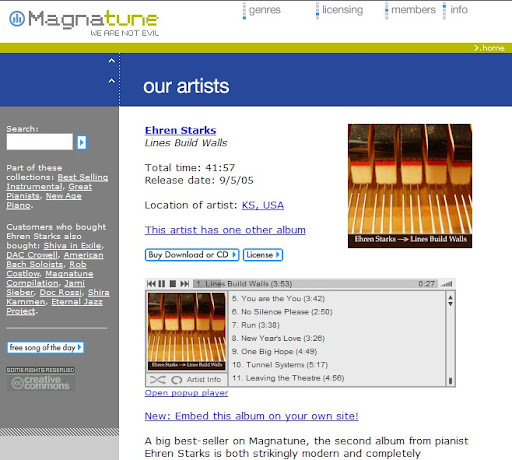 Magnatune also helps musicians to sale their music, if you are a musician you can sale your music via Magnatune.